Pets Costs > How Much Does a Hyacinth Macaw Cost? The Hyacinth Macaw is the largest of all parrots. Referred to as the “gentle giants,” Hyacinth Macaws can grow up to 40 inches long and weigh approximately 2 ½ pounds. They are known for their distinct cobalt blue feather covering them from head to toe as well as for their yellow eye rings. The average cost of a Hyacinth Macaw will depend on the breeder, color, personality, health, quality and age. From our research, the average Macaw via a reputable private breeder can cost anywhere from as little as $1,150 to more than $11,000. For a bird in a good health with no pertinent problems, it is best to budget at least $4,000 if you were to purchase from a reputable breeder. Due to taking a long time to effectively wean the bird, along with the survival rate, this is the reason the prices can be so high when in comparison to other bird breeds on the pet market. At BirdsNow.com, an online bird classified website, for example, they had close to 75 listings, with prices ranging from $1,500 to more than $11,000. The higher priced Hyacinth Macaw, from what we saw on the listing, was tamed, in good health and was a rare color. All of these characteristics, as you can see, can greatly affect the price. A reputable breeder should include a health guarantee, health certificate from a reputable veterinarian, and disease testing for common diseases such as PDD, PVD, PBFD, Polyoma, and Chlamydia. Being a larger-than-average pet bird, they will need a specialized high fat diet. In captivity, they will feed on a blend of vegetables, greens, nuts, particularly the macadamia nut, and fruit. Experts also recommend supplementing their diet with specially formulated pellets. As with any parrot, he or she will need a lot of enrichment inside of its cage to keep it entertained. The cage will also need to be as sturdy as possible due to the strength of its beak. Experts recommend a stainless steel cage large enough to fly from side to side comfortably and a height of at least six feet. Keep in mind their wingspan is as long as four feet, so the larger the cage can be, the more comfortable the parrot can be while in captivity. If at all possible, consider building a customized cage that’s safely enclosed. Its lifespan, as long as well taken care of in captivity, can be 50 to 60 years. While they can make for a great pet, they can be very nippy and loud. Be wary of cheaper Hyacinth Macaws as they could either have a disease and/or feather plucking problem. When these symptoms occur, owners often try to sell for as little as possible to recoup most of their investment. If in doubt, always receive a health guarantee and allow a vet to examine the bird before proceeding. Breeders advise against buying an unweaned Hyacinth Macaw because they have high mortality rates before weaning. Buying an unweaned bird can present potential problems, particularly for people who are not skilled in hand-feeding a bird. Novices are advised to purchase a weaned baby bird. At least 10,000 of these birds have been taken from the wild for illegal trade, and due to this, they are listed as being vulnerable due to the population decline over the years. It is recommend the Hyacinth Macaw is able to, at a minimum, play outside of its cage in a safe space for two to three hours to maintain their muscles. They tend to be the most friendly out of all Macaw, and in generally, they do seem to take more of an interest in humans in comparison to other birds. Their beaks can overgrow if they don’t have the appropriate items to chew on. 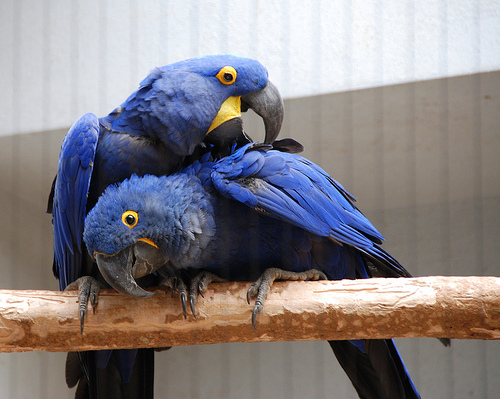 Hyacinth macaws are susceptible to proventricular dilatation disease, psittacosis and papillom. Its beak can carry over 200 pounds of pressure per square inch, meaning it could snap a broomstick in half with one bite. Consider checking out a local parrot rescue in your area if one is available. This is a great way to help a local organization and a bird that needs a home. Adoption, just like adopting a dog or cat, can be hundreds of dollars cheaper than buying from a private breeder often doing it for financial gains.